Today is the second session of Summer Term II of the 2013 GsD program with Applied Guestology 201, a quick review of some of the leading organizations who deliver exemplary Guest Experiences with application to ChurchWorld. 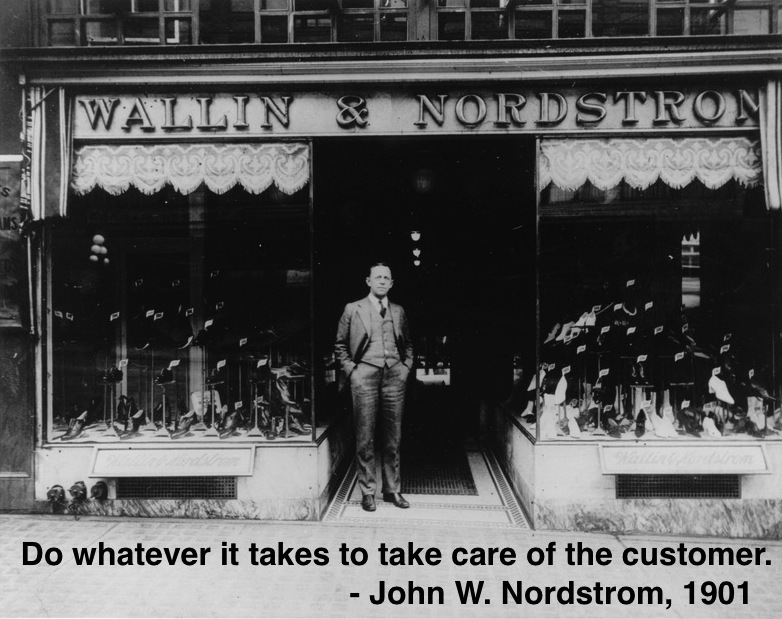 What started as a small shoe store in Seattle in 1901 now numbers over 250 stores and ships to 44 countries from its website. And while pleasing customers in 1901 was much different from pleasing customers in 2013, the cornerstone of the business has always been the people. It’s not about us being ranked on top or ‘best in class.’ It’s about doing what’s best for the customer. In fact, forget ‘best in class,’ the consumer is constantly raising the bar, and since they are setting the standard, we’re continually resetting ours upward. For some companies, Customer Service is the name of a department where people answer the phone to respond to customer inquiries and complaints. What companies like Nordstrom’s understand is that for them, customer service is embedded in all aspects of their company culture and seen as a vital means of achieving strategic competitive advantage. As such, these companies screen, hire, train and reward based on people who understand and act in accordance with their deeply held customer service philosophy. For these companies, service is more an “act of faith” than a response to a set of carefully crafted company policies or procedures. One five by seven index card. We’re glad to have you with our Company. Our number-one goal is to provide outstanding customer service. Set both your personal and professional goals high. We have great confidence in your ability to achieve them. Nordstrom Rules: Rule #1: Use your good judgment in all situations. There will be no additional rules. For many years, the words above were Nordstrom’s Employee Handbook – period. Even though they’ve added more HR type language in the last few years, Rule #1 above still guides their day-to-day, face-to-face operations and connections to customers. Do your values so permeate your organization that rules are minimized? In a recent speech to an industry gathering, Jamie Nordstrom (president of Nordstrom Direct) stressed the importance of company culture. Keeping the focus on the customer made it easier to set aside silos and work together on creating the best experiences possible, whether they’re in a store or on the web. It’s a valuable lesson in staying true to your company’s mission. Improving customer service is Nordstrom’s No. 1 goal, always. “How people define customer service — that is where the battle will continue to be won and lost,” said Nordstrom. To keep customers coming, retailers need to do a better job of creating experiences that customers value, evolving with the customer, so that those experiences always match — and exceed — expectations. “Customers will buy more when they’re happy,” says Nordstrom. And while this has always been the case, the challenge is that “what has made them happy has changed,” says Nordstrom. View every customer interaction as a STORY OPPORTUNITY. There are any number of stories about legendary customer service at Nordstrom’s. These “service stories” communicate more about a company’s culture and values than any single act. Train each of your employees that every customer interaction is a story opportunity, the first step in creating a legend about your company. These stories, repeated over and over, eventually become legends and serve to form the image of your company. Your team has the power to create positive legends by serving their customer in an exemplary fashion. Define service from the customer’s POINT OF VIEW. There is often a wide difference between management’s perception of exemplary performance and the customer’s viewpoint. When evaluating the quality of your product and the performance of your staff, ask your customers! No one is in a better position to judge. This means you need to continuously talk with your customers. Be proactive: ask questions right after a transaction; talk to them again in 10 months. Exceed your customers’ EXPECTATIONS. If you are meeting your customers’ expectations, you are already ahead of the game. You’ll have satisfied customers who will recommend you to their friends. But you cannot create Legends by simply meeting customers’ expectations. Legends are the result of an event that goes beyond the expected. We do not have a thick manual telling our employees what they can and cannot do to accomplish that goal, we just ask them to follow one rule: Use good judgment in all situations. We hope this philosophy not only empowers employees to provide the highest level of service to our customers but also inspires them and helps build a great workplace. Customers at the top: Our organizational chart is an inverted pyramid, with our customers at the top and our executive team at the bottom. It reminds us that our customers are the most important and our frontline employees, those who take care of the customer, are the most important people in the company. What kind of professional would thrive at Nordstrom? Build strong relationships, both with the customer and other team members. It’s easy to see why Nordstrom’s has been regarded as one of the top organizations delivering exemplary customer service for decades. Last fall, I was privileged to speak at the Worship Facility Expo and Conference on the topic of “Servant Leadership.” I had been doing research on Nordstrom’s customer service principles for several months, and found that those principles – reflected in what you read above – were easy to translate into the volunteer culture of churches. As a Guest Services Coordinator at Elevation Church’s Uptown Campus, it was easy for me to make some applications. For a more complete understanding of this approach, take a look at a 3-part series that begins here. This entry was posted in Guest Experience and tagged Applied Guestology 201, Church Guest Experience, GsD Summer 2013, Guest Experience, Nordstrom's, The Nordstrom Way to Customer Service Excellence. Bookmark the permalink.